As previously reported in our ‘corePHP’ update as anticipated, Joomla developers and community members today released Joomla version 3.4, with many notable improvements. The major improvements to Joomla’s version 3.4 release include simplified front-end content editing, performance improvements, additional high-level security measures, Composer integration, as well as over 700 bug fixes. In this new Joomla 3.4 release, front-end editing of Joomla modules is now working beautifully. This key feature has been on the roadmap for years, but only today, after a lot of work by Joomla Production Leadership Team of Joomla developers, front-end module editing is now a reality. This gives site content editors important access to perform content creation and editing without requiring back-end Admin access. Joomla developers and Joomla integrators will be happy with this new addition as well, as much of the workflow within Joomla can now shift to a kinder, simpler format, rather than requiring Content Editors and Content Marketers to access the far more complex back-end Admin interface of Joomla CMS. Joomla developers and administrators can focus on their admin functions, and Joomla content professionals can focus on creativity, proofreading, editing and building proper pages. Next, the Weblinks component has now been decoupled from Joomla’s core software. This is one of many planned streamlined updates to Joomla’s core, continuing to follow the practice of modularization, improving site performance, while reducing the footprint of Joomla CMS. Among other planned improvements, on the Joomla roadmap, core Joomla developers and Joomla designers, UX and UI pros will now shift their focus to improvements on Joomla’s admin interface, with particular focus on mobility, accessibility, and performance enhancements. Key ‘corePHP’ team members Steven Pignataro, Michael Pignataro and John Coonen assisted with contributions to the Joomla 3.4 release. Work has already begun by Joomla contributors on future releases, with ‘corePHP’ team members focused on major improvements to Joomla accessibility and 508 requirements, usability, further streamlining to the core CMS and enhancements to Joomla SEO capabilities. 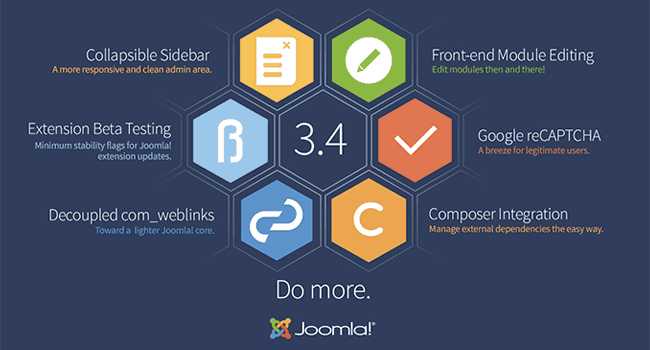 See more details about the new Joomla 3.4 release here, on the Joomla.org website. This entry was posted in Joomla and tagged core software, front-end, Joomla, Joomla 3.4, Release on February 25, 2015 by The Core Team.